Ok, I admit it I've been neglecting my "older" stamp sets. It's so easy to do when you get all these fabulous new sets. I've had Fabulous Flowers for a while now almost nine months but it's not one I' ve used very much. I'm not sure why because I love this large flower and I love the Dare to be Fabulous saying! I think one of the reasons I haven't used it too much is that while I don't mind stamping this image three times and cutting it out to give the flower dimension, it's not something my club members would be happy about. So, I never pulled it out to use with them. Well, today I saw it there looking a little forlorn and decided today was the day to use it! It just so happened that I had my Urban Garden DSP sitting out and I immediately noticed (ok so maybe some of you had already noticed but I hadn't) how similar the large flower in this paper looked to the large flower stamp. I decided I needed to use these two lovely things together! This card measures 51/2 x 51/2 so it's not your "typical" sized card. I used the Coluzzle to make the circles and them moved them over to the edge and cut them off on one side. 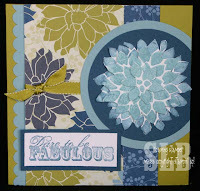 Of course I used Shimmery White to stamp the flower images and the greeting. All products from Stampin' Up!